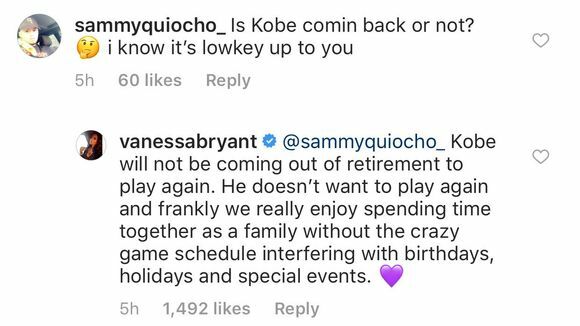 Vanessa Bryant says Kobe is happily retired. Kobe Bryant's former teammate Shaquille O'Neal recently sparked rumors that the Black Mamba was considering coming out of retirement to team up with LeBron James on the Los Angeles Lakers, telling TMZ, "Kobe coming back I heard. Kobe coming back, you heard it here first." Shaq's comments weren't to be taken seriously but it definitely had some Lakers fans dreaming of the possibility of a Kobe x LeBron lineup. Unfortunately, Kobe's wife, Vanessa, shot down those rumors almost instantly. When asked by a fan on instagram, "Is Kobe comin back or not?" Vanessa responded, "Kobe will not be coming out of retirement to play again. He doesn't want to play again and frankly we really enjoy spending time together as a family without the crazy game schedule interfering with birthdays, holidays and special events." Kobe, who has been busy with several off-court projects since retiring after the 2015-16 season, told ESPN's Stephen A. Smith the following after LeBron made his decision to join the Lakers. "I spoke to him during the playoffs, and then I talked to him last night, right after the decision," Bryant told Stephen A. Smith on ESPN Radio. "I told him, 'Welcome to the family, man.' It sounds crazy, but I said, 'Dude, you are part of the family now. So anything you need on my end, I got you. Whatever the case may be, I am here for you.' Just wishing him and his family the best and looking forward to seeing them when they get in."